Where I come from there is a saying. Everything is better deep fried. While I do not subscribe to the idea that EVERYTHING is better deep fried, I do know that the humble chicken breast is very tasty deep fried. Very, very tasty indeed! My mom taught me to deep fry a few months after she deemed me ready to start cooking on my own, sometime around my 13 birthday. With the exception of cookies, I was not allowed to do more than assist and watch what mom prepared. Watching, and talking about what she was doing, was how her mom taught her, and that is how she taught me. Should I ever have children of my own I will most likely do the same. It’s tradition. We did not eat a lot of deep fried foods growing up so when mom would make chicken fried steak or chicken tenders it was almost always a special occasion. I can only ever remember having my Aunt Ruby’s fried chicken when we went up for the week of Thanksgiving. She never made it any other time of the year, and she only made it then because the whole family was around to celebrate the holidays. 1. Never drop wet food, tongs, spiders, or slotted spoons in hot oil. Do the words, ‘Third-degree burns,’ mean anything to you? Yes? Good. 2. Make sure your oil is hot enough to do the job right. 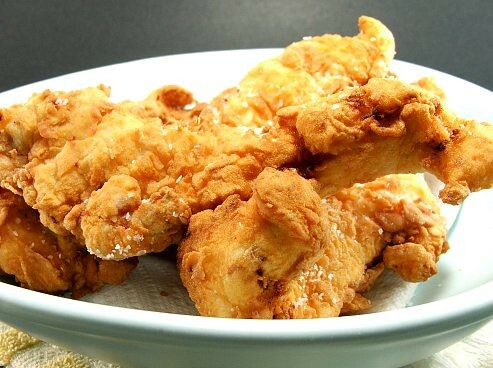 Cooking chicken in oil that is even ten degrees lower than it should be will result in soggy coating. Yuck. 3. Allow the oil to completely cool before you dispose of it, and NEVER pour oil down the drain. The first will prevent those third-degree burns we discussed, the second will keep the drains clear and prevent a waste water backup into your kitchen. 4. Allow at least three to four inches of room at the top of your pot so the oil does not spill over onto your hot burner and cause a fire. I know, it is all common sense, but it is sometimes good to review these things. I do it because I care! So, now that the safety rules are behind us, let’s get to frying!! 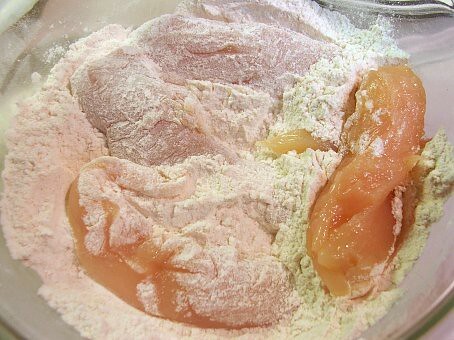 Slice your chicken into strips, if you are using chicken breast. Pat dry with paper towels and set aside. In the first bowl mix 1 cup of flour with the salt, red pepper and paprika. Mix well. In the second bowl mix the egg and buttermilk until well combined. In the third bowl put the remaining flour. 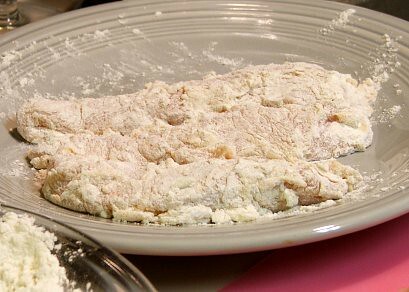 Dip the chicken strips, a few at a time, in the seasoned flour. Tap off any excess, but make sure the tender is fully coated. It is this flour that will make the coating stick. Next, dip the strip into the buttermilk. 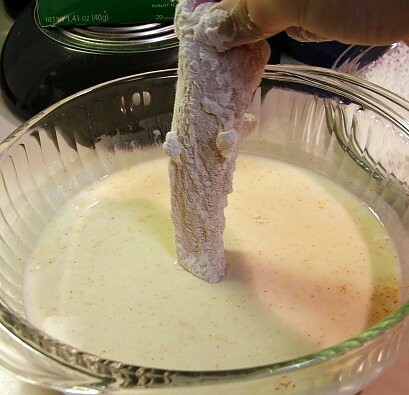 Allow the excess buttermilk to drain off. Last, dredge the strips in the plain flour. Place them on a plate, or sheet pan, to dry for at least thirty minutes. 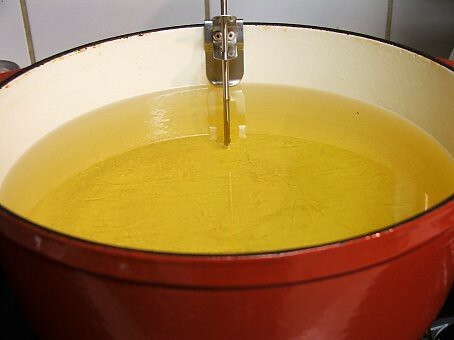 While the tenders dry heat the oil in a heavy bottom pot heat your oil over medium heat until it reaches 375F. 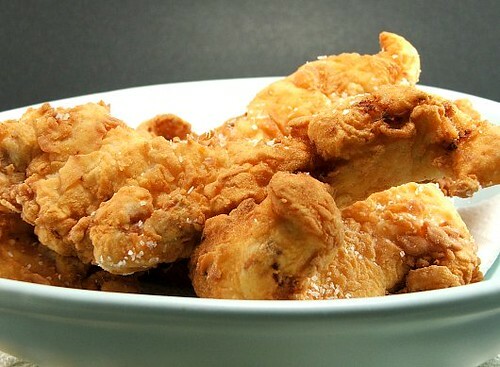 Carefully drop the tenders, no more than three at a time or less depending on the size of your pot, until they are golden brown, float to the surface of the oil, and read an internal temperature of 165F. Drain in a towel lined platter and season with salt. Serve warm with gravy, or other dipping sauce.